The gluttony games. It’s hard to believe that, having survived Extreme Christmas, people immediately, and without coercion, re-enter the retail ruckus. It’d take more than 20 per cent off lingerie and white goods to force me back into the Boxing Day fight-cage. Queensberry Rules be damned. I’d want spurs. Electric teeth. Revolving elbow-knives. Shopping is hard work; sometimes fun but always knackering. Christmas shopping in particular leaves you wrung out, not because of its physical demands but because of the constant decision-state required. Will great uncle Zanzibar like those particular sock stripes, or that particular snuff (movie)? What is there to which cousin Grace will give houseroom that won’t cost more to airmail than the entire relationship is worth? And in any case will it arrive in time? Yet this – this yearning for control, this relentless decision-greed – is what leaves modern humanity so stressed out. For with every decision comes responsibility. Even if it’s only responsibility to yourself (to ensure you’re not imbibing long-chain polymers in your water or giving yourself nano-cancer with your sunscreen), the constant need to make potentially life-death decisions with inadequate information is ceaseless. This can leave you – or at least me – feeling weirdly cirrus up there in the stratosphere; thin, wispy and dangerously blurred. So perhaps it’s unsurprising that the inverse also holds; that deprivation of choice can be a meditation. I’ve never been a meditation person – which is odd, because I’m an obvious case for treatment. But to my mind transcendental meditation, is the sole reason (apart from his beautiful hands) for Clint Eastwood’s screen-idol superiority over more worldly heroes like John Wayne or Gary Cooper. Indeed, I’d say it was transcendental meditation – and Ennio Morricone’s theme tune – that made The Good, the Bad and the Ugly one of the best films of all time. I make do. Swimming is good. Walking too offers a good mix of mental emetic and neuronal lullaby; a sense of stillness without the fact, which may be why I was intrigued enough recently to walk my first labyrinth. But labyrinthing (needs a good verb – Ed) is serious women’s business. Sally Quinn, columnist for The Washington Post, has a labyrinth, a concrete ground-pattern in the woods. She walks it regularly and swears that doing so has changed not just her life but also that of her son, who had severe learning difficulties. Here in Australia, Labyrinth Link Australia lists 82 labyrinths, 29 of them in Victoria. Most are private, though often rentable, with the rest mainly owned by churches and community groups. Many, like the one I walked in Mosman the other day, are replicas of the best-known labyrinth in Chartres Cathedral. All are used for therapy, focus, inspiration, relaxation and contemplation. But a labyrinth is a maze, right? Somewhere between the minotaur’s prison and Harry Potter’s enchanted maze, designed to bewitch and befuddle. What’s so relaxing about that? Well nothing. Wrong. A labyrinth is not a maze. The dictionary makes them synonyms but the terms as used are almost direct opposites. 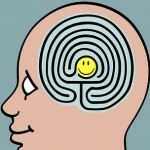 Where a labyrinth is unicursal (or single-pathed), a maze is multicursal. This small difference is a game-changer, because it’s about choice – and its absence. A maze, being multi-pathed, is a series of decision-points, any one of which could result in terminal confusion. A maze is therefore a struggle, a puzzle, a test. A labyrinth, having only one path, requires no decisions, so its complications become instead a sort of dance, engendering a curious feeling of trust. Emily Simpson is the proponent of Sydney’s first public labyrinth, recently approved near the Willow Pond in Centennial Park. As she puts it, the maze is an intellectual exercise while the labyrinth is a spiritual one. This all sounds terribly new agey, not least because it’s actually old-age, bronze age to be precise. Appearing across ancient Peru, Crete, Troy and Jericho, the labyrinth is said to have been used by old Norse-folk to propitiate good harvest and by Hindu midwives to relax the birth canal. But the labyrinth, converted up by the Romans into something that looks disturbingly like a brain diagram, flowered in the churches and cathedrals of 12th-14th century Europe. No-one is sure just how they were used. Some engravings look more like part of a social ritual, with people running the labyrinth even during services. One description from Auxerre tells of a game that involved pre-vespers dancing and ball-throwing among the clergy, through the 15th and 16th centuries (until the practice was outlawed in 1538). More curious is whether, and how, labyrinths work as meditative tools. A walk has three stages; the walk in (purgation or release), the still centre (illumination or receiving) and the walk out (union or returning). As a card-carrying sceptic, I’m hardly the ideal subject for this experiment. Yet despite this, and 30 or so other humans, I did experience a delicious, timeless trance and a lingering wellbeing. And there’s this. 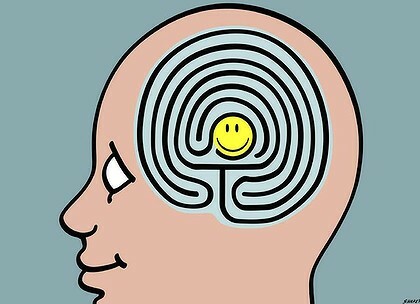 As trances go, labyrinth-walking is significantly more fun, and significantly less expensive, than the retail-hypnosis induced by your local Westfield. New Year’s resolution: reduce over-choice. Shop less, meditate more. Emily Simpson will run monthly labyrinth walks at Mosman Art Gallery from February 5. A new labyrinth adjacent to Marian Hall at St. Matthew’s Parish Page ACT was opened and blessed on Sunday 26 February 2012.